WTJU is located at 2244 Ivy Road in Charlottesville, VA, next to Vivace restaurant. Our studios are exactly one mile west of UVA’s Rotunda. By car: Parking is available both in front of and behind the building. The parking spaces in the back are handicap accessible. By bus: WTJU is served by the Purple Line of the University Transit system, at the same stop as the U-Heights housing complex. 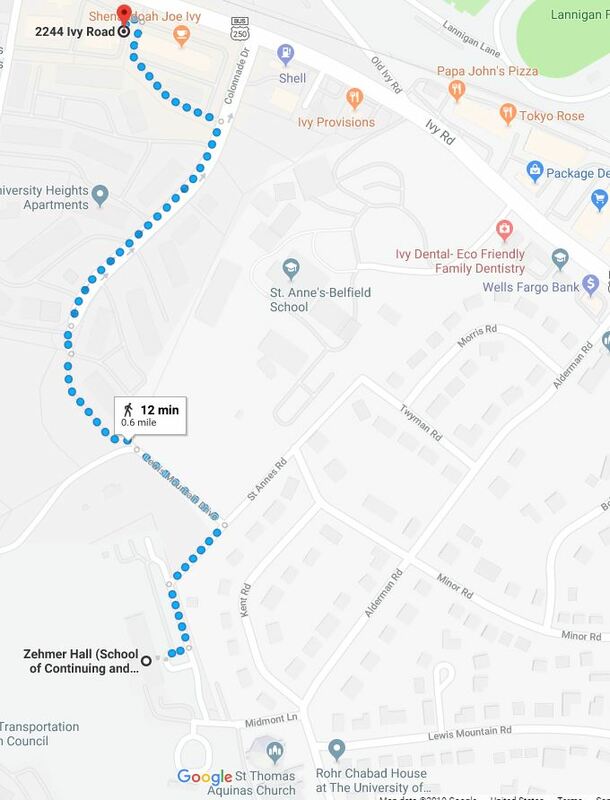 By foot / bike: Albemarle County is building new sidewalks and bike lanes on Ivy Road to WTJU and beyond, with an expected completion in early fall 2019. A pedestrian path from UVA’s Zehmer Hall, behind St. Anne’s-Belfield School, and through U-Heights also gets you here. Click for detailed google map of that route. Monday-Friday: 8:30 AM to 5:00 PM or by appointment. Sunday: Noon to 5:00 PM. Note: The 1st floor of WTJU is accessible to the disabled. WTJU doors are locked locked after office hours except during special events. After-hours access is possible if you have made previous arrangements. If you or your group would like to experience the inner workings of a radio station, call WTJU to schedule a tour. We are happy to conduct brief tours during your impromptu visits to WTJU if someone is available. It is best to schedule a visit in advance. If you would like to arrange a performance, please visit the staff webpage and contact the appropriate department. For bands who have already arranged to perform, general guidelines can be found here. These guidelines may vary depending on the individual group and show. Questions or concerns should be sent to wtju@virginia.edu.